I looked at a few quick stats on some of these cities that I thought I would report here. Atlanta, Cinci, Boston and Charlotte all have air quality problems in the form of ground level ozone, which make it hard to be outside some times. Charlotte and Cincinnati are in the American Lung Association’s 20 Most Polluted Cities for Ozone (Cinci and Atlanta in top 20 for particulates). Cincinnati was the highest ranked on Forbe’s 2007 list of the most Obese Cities at 11. Also on the list were Atlanta (16) and Austin (18). The Portland (11.7), Charlotte (12.4), Cincinnati (10.1) and Atlanta (10.7) areas all have unemployment above the national level (9.7). Median home prices were used to assess affordability. I think Atlanta and the southeast have great access to tons of interesting spots, including mountains and coast, but Atlanta certainly lacks its own body of water to enjoy. However, one of the first things mentioned in the Outside article is the presence of the Chattahoochee River in the city, though most people couldn’t tell you where it is. 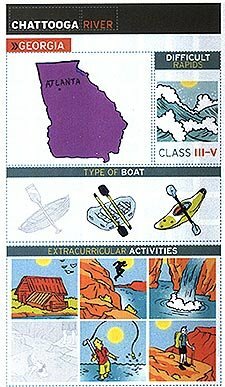 Proximity to skiing, which Atlanta definitely lacks, was also in the magazine’s multisport rating. My recent fascination with the West and disenchantment with the Midwest may explain some of my surprise at the relatively even distribution of the top ten throughout the US. (and my shock of seeing a city from Ohio in there) The more I think about this ranking and all the info going into the final scores, the more I think Atlanta is going to be near the top of a lot of lists of cities in America; good and bad. Any publicity is good publicity?